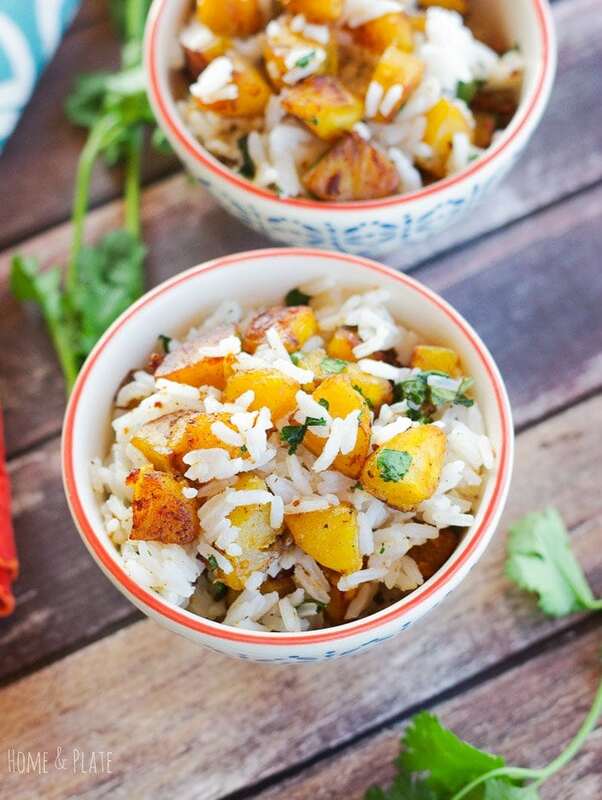 Celebrate Cinco de Mayo with an authentic Caribbean side dish that goes perfectly with margaritas and tacos, my Jasmine Rice with Plantains & Cilantro. 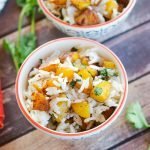 A recent trip to Cancun, Mexico inspired my love for this easy to make and delicious side dish. I indulged every time it was available on the buffet line. I even had it for breakfast one morning. 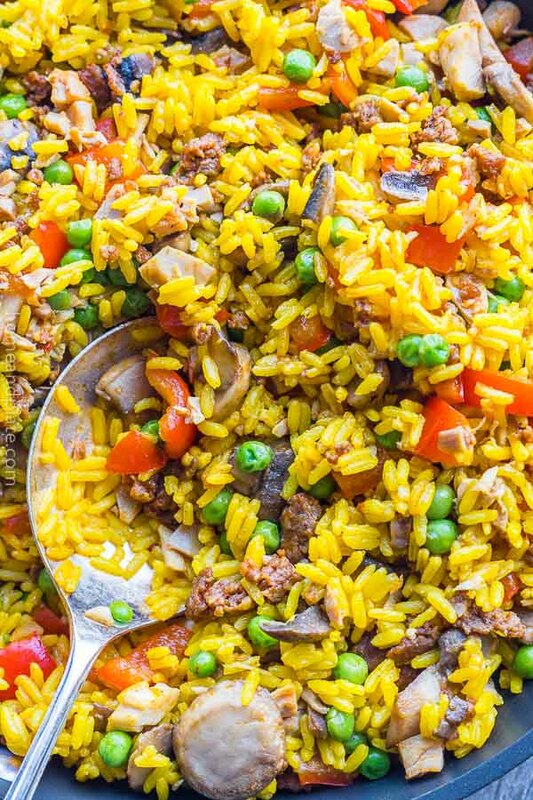 Is Jasmine rice with plantains easy to make? Yes…it’s so easy to make! It’s a matter of removing the fruit from it’s peel, sauteeing it until it is caramelized and adding it to a bowl of already prepared rice. What do you eat plantains with? Ripe plantains are sweet like a banana, without the banana flavor. They can be eaten raw but are best when fried. The trick with plantains is allowing them to ripen until they look almost black. Choose unblemished plantains and store them at room temperature. It can take up to a week or two to fully darken. When ready, chop off the ends and slide your fingers under the peel to remove it. This fruit has double the potassium of regular bananas and is lower in sugar than other members of the banana family. While they can be eaten raw when fully ripened, it’s customary to cook them first. Sautéing or roasting brings out a caramelized sweetness. So good! Roasted or fried plantains are delicious on top of vanilla ice cream with almonds and a sweet syrupy sauce. Get that recipe below! They also would be delicious caramelized and serve on top of pancakes with a drizzle of maple syrup. Have you seen plantains in the grocery store and wondered how to cook them? This recipe is easy and delicious and all your guests will be impressed with your Caribbean culinary flair! 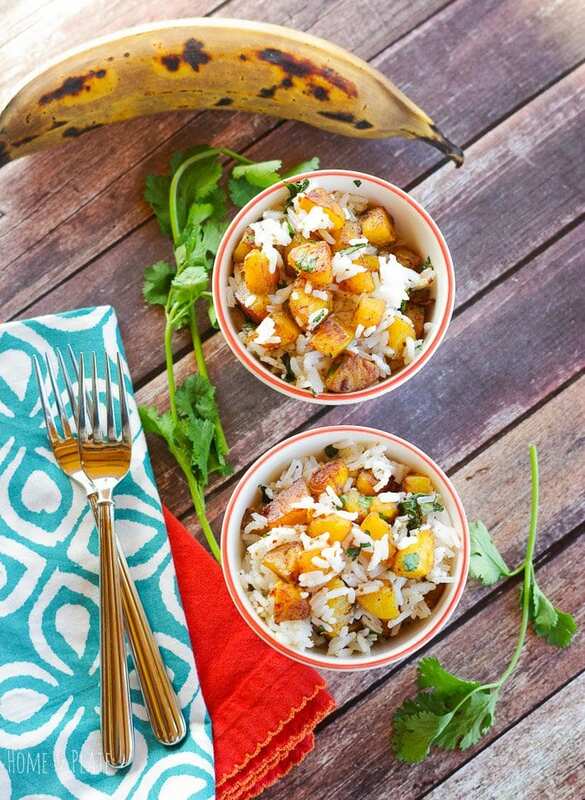 Love my Jasmine rice with plaintains? Then try these delicious recipes! Mix together to cups of water and one cup of jasmine rice and bring to a boil. Reduce the heat to low and cover allowing the rice to cook for about 20 minutes. Peel the plantain and chop into small cubes. In a medium skillet, sauté the plantain in the olive oil until golden brown and slightly crispy. Sprinkle with cloves, nutmeg and mix in the chopped cilantro. Stir for a minute more then set aside. Once the rice has cooked for almost 10 to 15 minutes in the water has evaporated stir in the plantain mixture. Finish cooking until the rice is completely cooked about 5 minutes more. This sounds so unusual and delicious, I love the spices you’ve got in there, nutmeg is one of my favorites! Your photos are stunning! I am a huge rice fan. 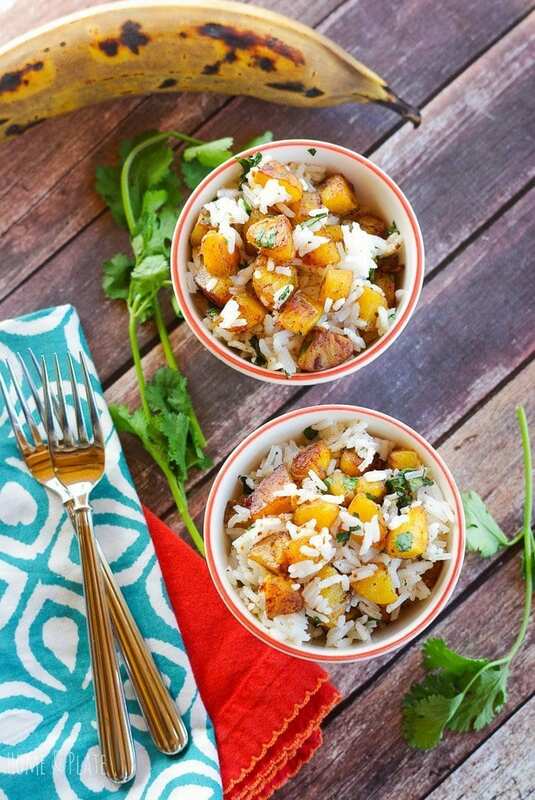 This jasmine rice sounds simply amazing! I can’t wait to try it out! Thanks so much Cindy. We eat a lot of rice too. I hope you give it a try. I have never cooked platiains but definitely a fan. Thanks for sharing this unique recipe. I have only ever had plantains dried into chips, which are amazing, so this is definitely something I need to try! Yum…chips sound great. Plantains are also tasty in place of bananas on an ice cream sundae. That recipe is coming soon. Thanks Karly. 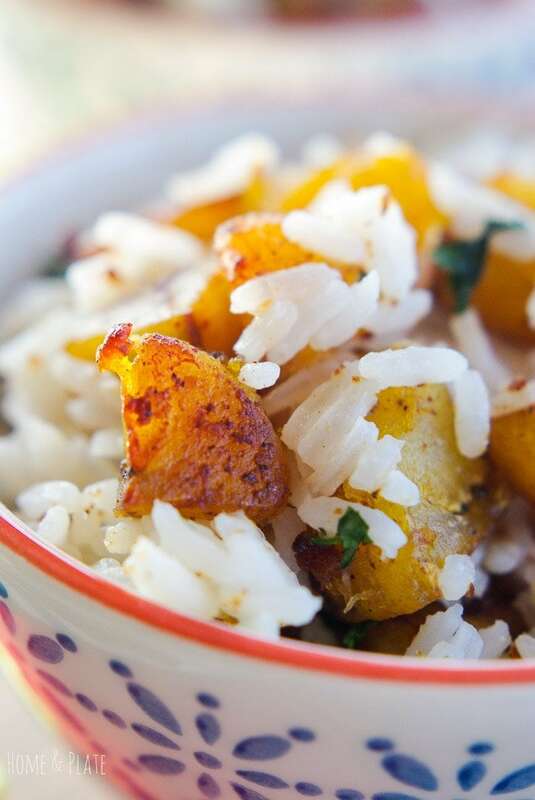 I absolutely adore jasmine rice and plantains but I never thought of combining the flavors. This looks so good! This looks like SUCH a perfect side dish! Love how fresh it all looks. YUM! I love plantains and am so happy to find another use for them! Thanks so much. This is become a favorite recipe of mine. I hope you enjoy it.